Page: COVER (1973) SOLD SOLD SOLD! Click Here To See FOOM #8 Magazine! Check out this beautiful 1973 Captain America cover, which was penciled by the great John Romita, for This great title! This great magazine cover features a Fantastic World War 2 BATTLE scene, with Captain America and Bucky battling and defeating SEVERAL Nazi soldiers, with Cap PROUDLY holding a "FOOM #8" FLAG!! Just a NICE cover, which was drawn on vellum on board, measuring 9.75 by 13.5 inches! 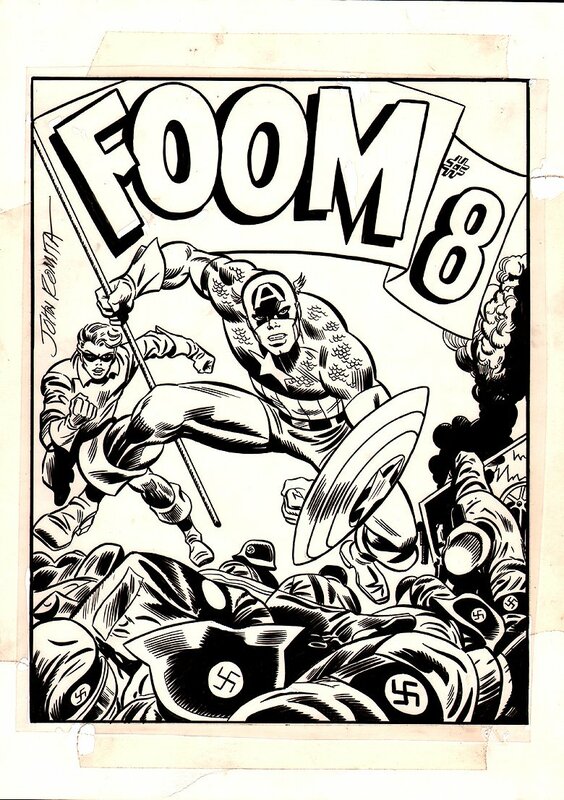 These FOOM covers were drawn to exact dimensions of the magazines there were printed for! Art is signed by the great John Romita on the left side of the cover! Compare this nice cover art to the published comic book in the red link above! FOR MAX!!!!!!!!!! !